Dunkirk is a 2017 war film written, directed, and produced by Christopher Nolan that depicts the Dunkirk evacuation of World War II. Its ensemble cast includes Fionn Whitehead, Tom Glynn-Carney, Jack Lowden, Harry Styles, Aneurin Barnard, James D'Arcy, Barry Keoghan, Kenneth Branagh, Cillian Murphy, Mark Rylance, and Tom Hardy. The film is a British-American-French-Dutch co-production, and was distributed by Warner Bros.
Dunkirk portrays the evacuation from three perspectives: land, sea, and air. It has little dialogue, as Nolan sought instead to create suspense from cinematography and music. Filming began in May 2016 in Dunkirk and ended that September in Los Angeles, when post-production began. Cinematographer Hoyte van Hoytema shot the film on IMAX 65 mm and 65 mm large-format film stock. Dunkirk has extensive practical effects, and employed thousands of extras as well as historic boats from the evacuation, and period aeroplanes. The film premiered on 13 July 2017 at Odeon Leicester Square in London, and was released in the United Kingdom and the United States on 21 July in IMAX, 70 mm, and 35 mm film formats. It is the highest-grossing World War II film, making $526 million worldwide. Dunkirk received praise for its screenplay, direction, musical score, sound effects, and cinematography; some critics called it Nolan's best work, and one of the greatest war films. The film received eight nominations at the 23rd Critics' Choice Awards, winning for Best Editing, eight at the 71st British Academy Film Awards, winning for Best Sound, and three at the 75th Golden Globe Awards. At the 90th Academy Awards, it received eight nominations, including Best Picture and Best Director (Nolan's first Oscar nomination for directing); it went on to win for Best Sound Editing, Best Sound Mixing, and Best Film Editing. In 1940, during the Battle of France, Allied soldiers have retreated to Dunkirk. Tommy, a young British private, is the sole survivor of a German ambush. At the beach, he finds thousands of troops awaiting evacuation and meets Gibson, who is burying a body. After a German dive-bomber attack, they find a wounded man. They rush his stretcher onto a hospital ship, hoping to get aboard, but are ordered off. The ship is sunk by dive bombers; Tommy helps another soldier, Alex, out of the water. They leave at night on a destroyer, but it is sunk by a U-boat. Gibson saves Tommy and Alex from the sinking ship, and they get back to the beach. With only a single, vulnerable mole available for mooring deep-draft ships, the Royal Navy requisitions civilian vessels in the UK that can get to the beach. In Weymouth, a civilian sailor named Dawson, with his son Peter, sets out on his boat Moonstone, rather than let the Navy commandeer her. Impulsively, Peter's teenage friend George joins them. At sea, they rescue a shivering shell-shocked soldier from a wrecked ship. When he realises that Dawson is sailing for Dunkirk, the soldier demands that they turn back and tries to wrest control of the boat; in the struggle, George falls and suffers a head injury that renders him blind. Three Spitfires cross the English Channel, heading towards Dunkirk. After their leader is shot down in a dogfight, one of the pilots, Farrier, assumes command, although his fuel gauge is shattered. They save a minesweeper from a German bomber, but the other Spitfire is hit and ditches. Its pilot, Collins, is rescued by Moonstone. Tommy, Alex and Gibson join some soldiers from a Highlanders regiment and hide inside a beached trawler outside the Allied perimeter. German troops shoot at the boat, and water enters through the bullet holes. Alex, hoping to lighten the boat, accuses Gibson, who has stayed silent, of being a German spy, and demands that he leave. Gibson reveals he is French; he stole the identity of the dead soldier he buried, hoping to be evacuated with the British. The group abandons the boat when it begins to sink. Gibson is unable to get out and drowns. Alex and Tommy swim towards a nearby destroyer, but it is sunk by a bomber. Moonstone manoeuvres to take on those in the water, including Alex and Tommy. Peter discovers that George is dead. Asked by the shell-shocked soldier, he lies that George is fine. Farrier shoots down the bomber before his fuel runs out. Gliding over the beach, he shoots down a dive-bomber, and then lands beyond the perimeter. He sets fire to his plane and is taken prisoner. At the beach, Royal Navy Commander Bolton watches the last British soldiers leave. He notes that nearly 300,000 have been evacuated, ten times more than Prime Minister Winston Churchill had hoped for. He stays to oversee the evacuation of the French. Arriving back in Weymouth, Dawson is congratulated for having saved so many men. The shell-shocked soldier sees George's body being carried away. Peter goes to the local newspaper; a front-page article later commends George as a hero. Tommy and Alex board a train, and receive a hero's welcome when the train arrives in Woking. "The empathy for the characters has nothing to do with their story. I did not want to go through the dialogue, tell the story of my characters... The problem is not who they are, who they pretend to be or where they come from. The only question I was interested in was: Will they get out of it? Will they be killed by the next bomb while trying to join the mole? Or will they be crushed by a boat while crossing?" Director Christopher Nolan conceived the film in the mid-1990s, when he and his future wife Emma Thomas sailed across the English Channel, following the path of many small boats in the Dunkirk evacuation. Nolan considered improvising the entire film instead of writing a script, but Thomas convinced him otherwise. In 2015, Nolan wrote a 76-page screenplay, which was about half the length of his usual scripts and his shortest to date. Its precise structure necessitated fictional characters, rather than ones based on eyewitnesses. The story is told from three perspectives—land (one week of action), sea (one day of action), and air (one hour of action). Nolan structured the film from the point of view of the characters, intending to use visuals rather than dialogue and backstory. He wanted to incorporate the so-called "snowball effect" that he had previously used only in the third acts of his other films. Nolan said that he approached research as though it were for a documentary, and was attracted to the project because of its inversion of the "Hollywood formula": the Battle of Dunkirk was not a victory and did not involve American armed forces, but nevertheless demanded a large-scale production to be put on screen. Nolan postponed Dunkirk until he had acquired sufficient experience directing large-scale action films. To convey the perspective of soldiers on the beach, for whom contact with the enemy was "extremely limited and intermittent", he did not show Germans on screen. He omitted scenes with Winston Churchill and the generals in war rooms, as he did not want to get "bogged down in the politics of the situation". Nolan showed key members of the crew eleven films that had inspired him: All Quiet on the Western Front (1930), The Wages of Fear (1953), Alien (1979), Speed (1994), Unstoppable (2010), Greed (1924), Sunrise (1927), Ryan's Daughter (1970), The Battle of Algiers (1966), Chariots of Fire (1981), and Foreign Correspondent (1940) – only two of which are war films. The historical consultant was author Joshua Levine, who also wrote the book adaptation, Dunkirk: The History Behind the Major Motion Picture. Levine accompanied Nolan while interviewing veterans. During these interviews, Nolan was told a story of soldiers seen walking into the sea in desperation, which he incorporated into the screenplay. The production team and scouting locations were chosen before Nolan and Thomas solicited Warner Bros. Pictures to make the film. Nolan and his production designer Nathan Crowley toured the beach of Dunkirk while location scouting, and decided to film there despite the logistical challenges, discarding Suffolk as an alternative. Crowley set up a makeshift art department in Nolan's old garage, as is tradition, and colourised black-and-white photographs to better understand the visual representation. The design aesthetic was made to look as contemporary as possible. Hoyte van Hoytema, who had previously collaborated with Nolan on Interstellar, was chosen as the director of photography. The Hollywood Reporter stated that Nolan made a deal with Warner Bros. to receive a $20 million salary plus 20% of the box office gross; however, Vanity Fair reported that Nolan agreed to receive a low upfront salary in exchange for a large backend percentage. Pre-production began in January 2016. For the uniforms, costume designer Jeffrey Kurland aimed to balance historical accuracy with aesthetics that would favour the film stock. As the original heavy wool fabric had not been produced since 1940, it was made from scratch, tailored for the main cast and over a thousand extras. Uniforms were made in a factory in Pakistan and the boots by a shoemaker in Mexico. The costume department then spent three weeks ageing them at Longcross Studios. Each garment was made to look distinct in regiment and personality: Tommy wears a large greatcoat, while Alex dons the Highlander cut. Kurland found references at museums, in contemporary magazines, photo archives, and books. The mole was rebuilt over four months from the original blueprints. [nb 3] Sand was brought from Dunkirk to create make-up consistent with the environment. Oil and tar were specially made and prosthetics were water and fire resistant. After first-hand accounts of the evacuation revealed how young and inexperienced the soldiers had been, Nolan decided to cast young and unknown actors for the beach setting. He was also adamant that all of the cast be British. [nb 4] John Papsidera and Toby Whale were the casting directors for Dunkirk. Tom Hardy, Kenneth Branagh, and Mark Rylance were in talks to join the ensemble as supporting characters in late 2015. Fionn Whitehead was cast as the lead in March 2016, while Jack Lowden, Aneurin Barnard, and Harry Styles were added shortly after. Cillian Murphy joined the following month. James D'Arcy, Barry Keoghan, and Tom Glynn-Carney were included later that May. Michael Caine was cast in a spoken cameo role as Fortis Leader, as a nod to his role in the film Battle of Britain (1969). According to D'Arcy and Nolan, Winnant and Bolton act as a Greek chorus to give the audience context. Whitehead went through a secretive auditioning process lasting several months. His character was named after the slang term for the ordinary British soldier. Styles was cast for his "old fashioned face", as stated by Nolan. He won the role after auditioning against hundreds of candidates, when Nolan was unaware of his renown as a singer. Murphy spoke to Nolan and read about the psychological trauma the soldiers endured, to understand his character's PTSD. Nolan chose Rylance for his work in the theatre and performance in Wolf Hall. As research, Rylance piloted his character's boat every day, listened to audio recordings at the Imperial War Museum, and read accounts of men like Mr Dawson. Between takes, he encouraged rehearsal through improvised scenes, which Nolan said "deepened the characterizations". John Nolan, uncle of Christopher, played Blind Man. Moonstone during filming with Nolan, Rylance, Glynn-Carney, and Keoghan on board. Maillé-Brézé at the port of Dunkirk during filming. Filming in Dunkirk took place at the location of the real evacuation, while the street scenes were shot in nearby Malo-les-Bains because most of the buildings in Dunkirk were destroyed in the war. Shooting times on the beach and mole were determined by tidal patterns. French labour strikes and working time regulations also affected the schedule. To minimise the need for computer-generated imagery (CGI), cardboard cut-out props of soldiers and military vehicles created the illusion of a large army. Real or scale model fighter aircraft, and real warships and private boats, provided realism that could not be achieved from CGI. Scale models were created via 3D printing. The mole set was frequently rebuilt after being damaged by bad weather. Because French authorities had prohibited pyrotechnic charges, to protect marine life, air cannons were used instead. Six thousand extras were needed in France. Early scenes of the film were shot at Weymouth harbour, and the final scenes at Swanage railway station. Universal Pictures' Falls Lake studio in Los Angeles was used for interior and exterior sets of a sinking ship and plane, with the ship interiors filmed in a water tank using stuntmen. To get acclimatised to the cold water scenes, Styles and Whitehead underwent training sessions at Point Dume in Malibu, California. The principal cast members did their own stunts. Crowley and marine coordinator Neil Andrea located nearly sixty ships, which Nolan had reconditioned for the shoot. These included the retired French Navy destroyer Maillé-Brézé, which was made to look like a 1940 British warship as there were no wartime British destroyers left with working engines. Three retired Royal Netherlands Navy ships were also used: the minesweeper HNLMS Naaldwijk portrayed HMS Britomart, HNLMS Sittard portrayed HMS Havant and HMS Jaguar, and MLV Castor (a Royal Netherlands Navy armed pilot vessel) portrayed HMS Basilisk. The motor torpedo boat MTB 102 and the 1930s Norwegian steamer Rogaland were also used. Over fifty other boats included twenty actual Little Ships of Dunkirk, piloted by their owners. 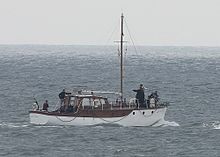 A small 1930s motor yacht called Moonstone served for six weeks of filming; its most demanding scenes, with up to sixty people on a boat designed for fewer than ten, were shot on the Dutch lake IJsselmeer to avoid the challenge of the Dunkirk tides. One of the Spitfires repainted for the film. Aircraft were equipped with dual cockpits for filming in flight. A Yakovlev Yak-52TW was modified to resemble a Supermarine Spitfire, and two Supermarine Spitfire Mark IAs, a Spitfire Mark VB, and a Hispano Buchon painted to look like a Messerschmitt Bf 109E, were also used for the combat scenes. Large-scale radio controlled model aircraft, including Heinkel He 111 and Junkers Ju 87 bombers, were filmed crashing into the English Channel. The real Spitfires were provided by the Imperial War Museum Duxford, and owner Dan Friedkin piloted the one that was shot landing on the beach in Dunkirk. These takes had to be done within forty-five minutes, before the tide came back in. IMAX cameras were attached to the fighter planes using specially made snorkel and periscope lenses – in the back and the front – and large-scale mockups were submerged with cable rigs for a crash scene. Scroggins Aviation and Gateguards UK performed period aviation reconstruction. A Piper Aerostar enabled filming from the air, also with IMAX cameras front and rear. Dogfights over the Channel were shot by an aerial unit based at Lee-on-Solent Airfield. Hardy and Lowden spent the final stages of the shooting schedule on a cliffside in Palos Verdes, inside purpose-built cockpit gimbals, with limited contact with the rest of the cast and crew. Principal photography ended on 2 September 2016, after sixty-eight days. The film was shot in natural lighting using both IMAX 65 mm and 65 mm large format film stock in Panavision System 65, with more IMAX footage than in any of Nolan's previous films – an estimated seventy-five percent. The sparsity of dialogue made it possible for IMAX cameras, which are notoriously noisy, to be used as the primary format. Panavision and IMAX lenses enabled filming at night. For the first time in a feature film, IMAX cameras were used hand-held, which Steven Spielberg and Ron Howard advised as the best way to shoot on vessels. 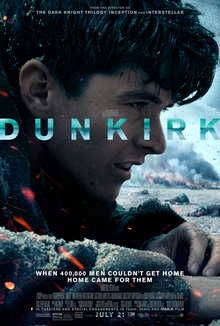 Nolan's regular collaborator Lee Smith returned to edit Dunkirk, beginning in September 2016 after Smith had assembled shots unsupervised while filming was still in progress. Editing took place in Los Angeles with an audio mixing team of eight people. Nolan said: "You stop seeing the wood for the trees", and singled out the editing of the aerial sequences as a particular challenge, likening this to a chess game. Limited computer-generated imagery was applied to improve some scenes, but none consisted entirely of CGI. Weather continuity presented less of a challenge than was expected, with filming both in Europe and California. At least ten to fifteen feature-length versions were cut to further refine the dramatic impact. Once a cut was completed, only then did they apply music. Post-production had fifty-four hours of raw footage to work with. The only usable sounds from production recordings were voices – everything else was recreated. Sound designer Richard King sent two sound mixers to audio record the Spitfires at the Imperial War Museum Duxford using twenty-four microphones. Unable to find an actual dive siren of a Stuka dive bomber, King reverse engineered one from old photographs in an attempt to replicate the sound. For scenes in which ships gave out sounds of people in distress, voices were captured using an ADR "loop group". C-4 and liquid propane were blown up to record sound for the explosions. Also featured were the whistles attributed to German bombs during the Second World War. Bomb noises were made to increase in pitch the closer they got to impact, to stay true to reality. Double Negative undertook the visual effects work while FotoKem, which assisted as the production's film laboratory, also handled the release prints. Hans Zimmer began working on the score in 2016, continued for eleven months, and eventually created a 100-minute demo. For intensity, the script was written to accommodate the auditory illusion of a Shepard tone, which had previously been explored in Nolan's 2006 film The Prestige. This was coupled with the sound of Nolan's own pocket watch, which he recorded and sent to Zimmer to be synthesised. Additional music was provided by Lorne Balfe, Andrew Kawczynski, Steve Mazzaro, and Benjamin Wallfisch. "Nimrod" from Edward Elgar's Enigma Variations is part of the theme, which was slowed down to six beats per minute with added bass notes to avoid it sounding sentimental. Instrumentation included a double bass and fourteen cellos played in high register. King relayed to Zimmer the sound of a boat engine, which served as a reference for the tempo. Zimmer visited the Dunkirk set for inspiration, taking back a jar of sand, and chose not to view raw footage whilst composing the score. The music was recorded at AIR Lyndhurst Hall in London with Geoff Foster as mix engineer. The world premiere was on 13 July 2017 at Odeon Leicester Square in London. The film was theatrically released on 21 July, projected on IMAX, 70 mm and 35 mm film. It is the fourth Nolan film to be released in the third week of July, a period in which Warner Bros. Pictures has previously achieved success. It was Nolan's preference that the film opened in July instead of the northern-hemisphere autumn awards season. The film was initially screened in 125 theatres in 70 mm, the widest release in that format in twenty-five years. Dunkirk received a special IMAX screening at the 2017 Toronto International Film Festival, the first Nolan film to appear at the festival since Following, nineteen years earlier. After its original release of 126 days, the film was re-released in fifty IMAX and 70 mm theatres on 1 December, expanding to 250 additional cities in January 2018. Dunkirk was released digitally on 12 December 2017, and on 4K Ultra HD, Blu-ray, and DVD on 18 December in the United Kingdom and 19 December in the United States. The announcement teaser debuted in cinemas ahead of Suicide Squad and was released online on 4 August 2016. According to data analytics firm ListenFirst Media, it generated the most Twitter engagement of any trailer released that week. The first full-length trailer was released on 14 December 2016, alongside a five-minute cinema-exclusive prologue shown before selected IMAX screenings of Rogue One: A Star Wars Story. Dunkirk was the most discussed film that week according to media measurement firm comScore. The prologue returned for a week before selected IMAX showings of Kong: Skull Island. Footage from the film was well received at CinemaCon 2017. Warner Bros. aired a TV spot to coincide with the 2017 US national basketball playoffs. The official trailer was released on 5 May 2017, after a countdown on the film's website and four 15-second teasers leading up to it. Dunkirk was again the most discussed film that week according to ComScore. The video game developer Wargaming included in its titles World of Tanks, World of Warships and World of Warplanes missions and rewards related to the film. On 6 July, Warner Bros. released another trailer, which for the third time was the most discussed film of the week. The prologue was shown at selected Wonder Woman IMAX screenings in July. It also toured nine cities in three European countries with a mobile cinema. Sue Kroll, president of Warner Bros. Worldwide Marketing and Distribution, said that it was important that Dunkirk be marketed as a summer event movie as opposed to a period war film, to highlight its "magnificent scale and originality". This strategy was maintained throughout the campaign. To convince audiences that the film was best experienced in theatres, the prologue was never made available online. TV spots were distributed sporadically during sports games and notable television series to establish the film's themes. Social media infographics described the scale and importance of the Dunkirk evacuation. Additionally, a Google 360 Experience interactive adventure, an Amazon Alexa programme, and a 360-degree short film, were created. In partnership with fast food restaurant Carl's Jr., the film was branded on four million cups, as well as pop-ups at nearly 3,000 locations. Research saw the film appeal to twenty percent of infrequent moviegoers. Dunkirk grossed $190.1 million in the United States and Canada, and $337.2 million in other countries, for a worldwide total of $527.3 million, against a production budget of $100–150 million. Globally, it is the highest-grossing World War II film (not adjusting for inflation), surpassing Saving Private Ryan's $481.8 million. In the United States and Canada, industry tracking for the opening weekend ranged from Variety's $30–40 million to Deadline Hollywood's $35 million, while BoxOffice speculated an opening weekend of $55 million, and IndieWire $50 million and $500 million worldwide. Dunkirk made $19.8 million on its first day, including $5.5 million from preview screenings. It went on to finish first at the box office with $50.1 million, marking the third-largest opening for a World War II film (behind Captain America: The First Avenger's $62.1 million and Pearl Harbor's $59.1 million), as well as the fourth largest of Nolan's career. In its second weekend, it grossed $26.6 million (a drop of 44.3%), beating newcomer The Emoji Movie to the top spot. The film grossed $17.1 million in its third weekend, second to newcomer The Dark Tower ($19.2 million), and was again second in its fourth week, behind Annabelle: Creation with $10.9 million. The film opened in France on 19 July 2017, and made $2.2 million on its first day. It was released in seven markets the following day, earning an additional $6.3 million, and on 21 July in forty-six more countries, grossing $12.7 million from over ten thousand theatres, including $3.7 million from the United Kingdom. The international debut totalled $55.4 million, including $4.9 million in France, $12.4 million in the UK and $10.3 million in Korea. The film remained number one in the United Kingdom for five weeks. It opened in China on 1 September in the top spot, grossing $30 million from its weekend debut. Its opening weekend in Japan earned $2.9 million from 444 screens. Dunkirk received praise for its screenplay, direction, musical score, and cinematography. Some critics called it Nolan's best film to date and one of the greatest war films ever made. On the review aggregator Rotten Tomatoes, the film holds an approval rating of 92% based on 420 reviews, with an average of 8.7/10. The website's critical consensus reads: "Dunkirk serves up emotionally satisfying spectacle, delivered by a writer-director in full command of his craft and brought to life by a gifted ensemble cast that honors the fact-based story." On Metacritic, the film has a weighted average score of 94 out of 100 based on reviews from 53 critics, indicating "universal acclaim". According to MRQE, it has an average rating of 85/100, based on 127 critics. Audiences polled by CinemaScore gave the film an average grade of "A−" on an A+ to F scale, while PostTrak reported filmgoers gave it an 88% overall positive score. Peter Bradshaw of The Guardian awarded the film five out of five and called it Nolan's best to date, saying that he "surrounds his audience with chaos and horror from the outset, and amazing images and dazzlingly accomplished set pieces on a huge 70mm screen, particularly the pontoon crammed with soldiers extending into the churning sea, exposed to enemy aircraft". Todd McCarthy of The Hollywood Reporter also lauded the film, calling it "an impressionist masterpiece" that was "deeply moving" but without "manufactured sentimentality or false heroics." He also praised the score, which "enormously strengthens the film" and "incorporates both sound and music to extraordinary effect". Peter Debruge of Variety praised the plot (although calling Zimmer's score "bombastic"), writing: "[Nolan has] delivered all the spectacle of a big-screen tentpole, ratcheting up both the tension and heroism through his intricate and occasionally overwhelming sound design." Manohla Dargis of The New York Times described the film as a "tour de force of cinematic craft and technique" and lauded Nolan's elastic approach to narrative. Mick LaSalle of the San Francisco Chronicle called it a "triumph" and "masterpiece", commending Nolan's unique approach to directing a war film and praising the performances. The Economist labelled Dunkirk "a remarkable film" and a new classic. Richard Roeper of the Chicago Sun-Times gave the film four out of four and said it was one of the best war movies of the decade, describing it as "tight, gripping, deeply involving and unforgettable ... triumph in filmmaking". Chris Nashawaty of Entertainment Weekly gave the film an "A", calling it the best of 2017: "By the end of Dunkirk, what stands out the most isn’t its inspirational message or everyday heroism. It’s the small indelible, unshakeable images that accumulate like the details in the corner of a mural." Robbie Collin of The Daily Telegraph gave the film five out of five, lauding it as "a work of heart-hammering intensity and grandeur". Peter Travers of Rolling Stone awarded it his first four-star rating of 2017 as "maybe the greatest war film ever", adding: "There's little doubt that [Nolan] has, without sentimentality or sanctimony, raised [the survival film] genre to the level of art...with the resonant force of an enduring screen classic." He also called it the first major Oscar contender of the year. Michael Medved awarded it four out of four and called Hardy's performance "outstanding", and the action "seamless", declaring: "This is not only the best WWII movie since Saving Private Ryan, it is very simply one of the greatest war movies ever made." Matt Zoller Seitz of RogerEbert.com gave it a score of three and a half out of four, despite not liking the film, stating that he "loathed parts of it and found other parts repetitious or half-baked. But, maybe paradoxically, I admired it throughout, and have been thinking about it constantly." Jacques Mandelbaum of Le Monde praised the film's realism, but was disappointed that it ignores the part played by French troops. Kevin Maher in The Times gave it two out of five, saying: "[Dunkirk] is 106 clamorous minutes of big-screen bombast that's so concerned with its own spectacle and scale that it neglects to deliver the most crucial element—drama." He also suggested that Dunkirk felt like a Call of Duty video game. David Cox of The Guardian felt the film had historical inaccuracies, a paucity of female characters, small scale, a thinly characterised cast and lack of suspense. In a literary review for the London Review of Books, Michael Wood compared it to the films of Luis Buñuel and commended Zimmer's soundtrack as an effective match to the film. In 2018, a poll of 150 actors, directors, writers, producers, and critics for Time Out magazine saw it ranked among the "100 Best British Films" of all time. The same year, The Washington Post named Dunkirk as one of the "23 best films of the 2000s". The film received the Best Editing award at the 23rd Critics' Choice Awards, and seven further nominations: for Best Picture, Best Director, Best Acting Ensemble, Best Cinematography, Best Visual Effects, Best Score, and Best Production Design. It also won the Best Sound award at the 71st British Academy Film Awards as well as seven nominations: for Best Film, Best Direction, Best Original Music, Best Cinematography, Best Editing, Best Production Design, and Best Special Visual Effects. At the 75th Golden Globe Awards, it received three nominations, for Best Motion Picture – Drama, Best Director, and Best Original Score. At the 90th Academy Awards, it was awarded Best Sound Editing, Best Sound Mixing, and Best Film Editing, with five further nominations for Best Picture, Best Director,[nb 8] Best Cinematography, Best Original Score, and Best Production Design. The film was noted for its generally realistic representation of the historical evacuation. It accurately depicts a few Royal Air Force planes dogfighting the Luftwaffe over the sea, limited to one hour of operation by their fuel capacity. In 1940, destroyers and fighter planes were indeed held back from battle, as the Royal Navy and Air Force would have been the sole defenders against invasion. Also noted were the accurate depictions of how a small boat attempted to evade aerial attack, and of how soldiers returning to England saw a civilian population largely unaware of or unaffected by the war. British officers did initially refuse to evacuate French soldiers, although Churchill later insisted that the French be evacuated alongside the British. The overall realism of the film was acknowledged by surviving Dunkirk veterans, although Branagh said that some thought it was "louder than the battle". Hispano Buchon masquerading as a Bf 109E, wearing a temporary paint scheme for the film. Although some events are based on true history, the characters and the storyline are fictional; Branagh's role is a composite character. When the beach scenes were shot, the weather was worse than during the real evacuation; Nolan explained that this helped to understand the danger faced by the pleasure boats. In one scene, an officer gives a salute without wearing his military beret, which a veteran pointed out as inaccurate protocol. To differentiate the German planes, their noses were painted yellow; this was not actually done until a month after Dunkirk. The involvement of French, African, and Indian soldiers was either limited or left out. Contemporary shots were used for aerial views of the town, whereas in reality Dunkirk was substantially in ruins by the time of the evacuation. The design of the airborne leaflet propaganda was similar to those used in 1940, although the originals were not in colour. ^ Additional production by Warner Bros. Pictures, RatPac-Dune Entertainment, Canal+, Ciné+, and Studiocanal. ^ The Netherlands Film Fund reported a budget of $123 million in May 2017. That July, it was estimated to be as high as $150 million, with sources at Warner Bros. describing that figure as too high. Later estimates reported a net production budget of $100 million or just below that. In February 2018, producer Emma Thomas said it was made for half the budget as that of Interstellar – $165 million. ^ The construction came at a cost of $900,000. ^ Barry Keoghan and Cillian Murphy, however, are Irish. ^ Dunkirk was approved under the French international tax rebate scheme. ^ The film received $1.2 million through the Netherlands' rebate incentive programme. ^ In the course of shooting, Dunkirk operated under the working title "Bodega Bay", a place in Northern California suggested by production designer Nathan Crowley. ^ This marked Nolan's first nomination for Best Director at the Academy Awards. ^ a b Debruge, Peter (17 July 2017). "Film Review: Christopher Nolan's 'Dunkirk'". Variety. Archived from the original on 23 July 2017. ^ "Film Releases". Variety Insight. Archived from the original on 13 July 2017. ^ a b c "WORLDWIDE RELEASE DATES". DunkirkMovie.com. Archived from the original on 9 July 2017. ^ "DUNKIRK (2017)". British Board of Film Classification. Archived from the original on 5 July 2017. ^ a b c d "British Films Directory". British Council. Archived from the original on 30 December 2016. ^ Staff (May 2017). "Production and Financing". Film Facts and Figures of the Netherlands. The Netherlands Film Fund. p. 11. Archived from the original on 16 May 2018 – via issuu. ^ Kelley, Seth (19 July 2017). "Box Office: 'Dunkirk' Battles 'Girls Trip,' While 'Valerian' Looks to Sputter". Variety. Archived from the original on 20 July 2017. ^ Faughnder, Ryan (19 July 2017). "'Dunkirk' likely to win rare box-office battle of original big-budget movies". Los Angeles Times. Archived from the original on 19 July 2017. ^ McClintock, Pamela (20 July 2017). "Box-Office Preview: Can 'Dunkirk' Battle Past $40M in U.S. Debut?". The Hollywood Reporter. Archived from the original on 15 May 2018. ^ McClintock, Pamela (23 July 2017). "Box Office: 'Dunkirk' Conquers Competition With $50.5M Debut; 'Valerian' Bombs". The Hollywood Reporter. Archived from the original on 25 July 2017. ^ Kelley, Seth (23 July 2017). "Box Office: 'Dunkirk' Conquers Weekend With $50.5 Million, 'Valerian' Flops". Variety. Archived from the original on 23 July 2017. ^ Utichi, Joe (23 February 2018). "For Christopher Nolan's Producer And Partner Emma Thomas, Maintaining A Winning Streak Is Essential". Deadline Hollywood. Archived from the original on 15 May 2018. ^ "Interstellar". Box Office Mojo. Archived from the original on 18 June 2018. ^ a b c "Dunkirk (2017)". Box Office Mojo. Archived from the original on 23 December 2017. ^ a b Gonzalez, Umberto (1 March 2017). "Christopher Nolan's 'Dunkirk' Will Have 'Little Dialogue'". TheWrap. Archived from the original on 1 March 2017. ^ a b c d e f g h i j k l m n o p q r s t u v w x Mottram 2017, p. 59–135. ^ a b c d e f g h i j k l m n o p q r Mottram 2017, p. 11–54. ^ a b Buckley, Cara (12 July 2017). "Christopher Nolan's Latest Time-Bending Feat? 'Dunkirk'". The New York Times. Archived from the original on 12 July 2017. ^ Kizu, Kyle (4 August 2017). "Christopher Nolan Wanted to Shoot 'Dunkirk' Without a Script". The Hollywood Reporter. Archived from the original on 5 August 2017. ^ a b Coyle, Jake (14 July 2017). "Tick-Tock: Christopher Nolan on the rhythm of 'Dunkirk'". ABC News. Archived from the original on 15 July 2017. ^ a b Merry, Stephanie (14 July 2017). "'Dunkirk' director Christopher Nolan excels at building suspense. Here's how he does it". The Washington Post. Archived from the original on 15 July 2017. ^ a b c d e f g h i j k l m Maytum, Matt; Crowther, Jane (Summer 2017). "'Dunkirk'". Total Film. No. 260. pp. 56–65. ^ McClintock, Pamela (20 June 2017). "'Dunkirk' Is Christopher Nolan's Shortest Film Since His Directorial Debut". The Hollywood Reporter. Archived from the original on 21 June 2017. ^ a b c d e Koehler, Robert. "WWII on a Grand Scale". Directors Guild of America. Archived from the original on 26 June 2017. ^ Stolworthy, Jacob (1 March 2017). "Dunkirk: Christopher Nolan reveals war film is told through three perspectives, has 'little dialogue'". The Independent. Archived from the original on 1 March 2017. ^ Sullivan, Kevin P. (13 July 2017). "What Dunkirk owes to Mad Max: Fury Road". Entertainment Weekly. Archived from the original on 22 July 2017. ^ Sullivan, Kevin P. (18 July 2017). "How Christopher Nolan crafted his WWII masterpiece, Dunkirk". Entertainment Weekly. Archived from the original on 22 July 2017. ^ a b Whitty, Stephen (16 July 2017). "Chris Nolan on 'Dunkirk', and leaving the 'Dark Knight' behind". NJ.com. Archived from the original on 16 July 2017. ^ Furness, Hannah (7 July 2017). "New Dunkirk film won't feature Churchill so it doesn't get 'bogged down' with politics". The Daily Telegraph. Archived from the original on 8 July 2017. ^ "Christopher Nolan curates BFI Southbank season of influences on new film Dunkirk". British Film Institute. 24 May 2017. Archived from the original on 24 May 2017. ^ a b c d e f g h Jolin, Dan. "Blood and Sand". Empire. No. 338. pp. 88–93. ^ Onwuemezi, Natasha (20 June 2017). "HC lands book rights to Dunkirk film starring Tom Hardy". The Bookseller. Archived from the original on 21 June 2017. ^ a b c Nolan, Christopher (8 July 2017). "Spitfires, flotillas of boats, rough seas and 1,000 extras: Christopher Nolan on the making of Dunkirk, his most challenging film to date". The Daily Telegraph. Archived from the original on 10 July 2017. ^ Greene, David (20 July 2017). "'Dunkirk' Director Christopher Nolan: 'We Really Try To Put You On That Beach'". NPR. Archived from the original on 20 July 2017. ^ Grobar, Matt (28 November 2017). "'Dunkirk' Production Designer Nathan Crowley On "Rawness, Simplicity & Brutalism" Of World War II Epic". Deadline Hollywood. Archived from the original on 6 January 2018. ^ Anderton, Ethan (6 February 2016). "'Interstellar' Cinematographer Hoyte van Hoytema Reuniting with Christopher Nolan for 'Dunkirk'". /Film. Archived from the original on 25 May 2016. ^ Staff (29 September 2016). "Hollywood Salaries 2016: Who Got Raises (and Who Didn't), From Movie Stars to Showrunners". The Hollywood Reporter. Archived from the original on 2 October 2016. ^ Miller, Julie (21 July 2017). "The Secrets of Hollywood's Highest-Paid Directors". Vanity Fair. Archived from the original on 16 October 2017. ^ a b c Lewis, Andy (5 January 2018). "Making of 'Dunkirk': Christopher Nolan's Obsessive $100M Re-creation of the Pivotal WWII Battle". The Hollywood Reporter. Archived from the original on 5 January 2018. ^ Dane, Patrick (27 December 2016). "Christopher Nolan Talks About Newcomer Fionn Whitehead In New Dunkirk Photo". Bleeding Cool. Archived from the original on 28 December 2016. ^ Kaufman, Amy (31 March 2017). "Christopher Nolan reveals what makes the war story 'Dunkirk' a great suspense thriller". Los Angeles Times. Archived from the original on 16 April 2017. ^ "WATCH: 'They're always looking out for you' – Dunkirk's Barry Keoghan on working with Irish actors in Hollywood". Irish Independent. 20 July 2017. Archived from the original on 21 July 2017. ^ a b Kroll, Justin (28 December 2015). "Christopher Nolan to Direct Action Thriller 'Dunkirk' for Warner Bros. (EXCLUSIVE)". Variety. Archived from the original on 28 December 2015. ^ Ford, Rebecca (28 December 2015). "Christopher Nolan to Direct WWII Film 'Dunkirk' With Tom Hardy, Kenneth Branagh". The Hollywood Reporter. Archived from the original on 31 December 2015. ^ Sneider, Jeff (10 March 2016). "Christopher Nolan Eyes Newcomer Fionn Whitehead for Lead in WWII Movie 'Dunkirk' (Exclusive)". TheWrap. Archived from the original on 15 March 2016. ^ Jaafar, Ali (11 March 2016). "Jack Lowden & Aneurin Barnard In Talks For Major Roles In Christopher Nolan's 'Dunkirk'". Deadline Hollywood. Archived from the original on 12 March 2016. ^ Hooton, Christopher (14 March 2016). "Christopher Nolan's Dunkirk casts Harry Styles of all people". The Independent. Archived from the original on 14 March 2016. ^ Stolworthy, Jacob (6 April 2016). "Peaky Blinders actor Cillian Murphy to reunite with Christopher Nolan for WW2 drama Dunkirk". The Independent. Archived from the original on 6 April 2016. ^ McNary, Dave (23 May 2016). "Christopher Nolan's 'Dunkirk' Begins Filming in France". Variety. Archived from the original on 24 May 2016. ^ Anderton, Ethan (23 May 2016). "'Dunkirk' Synopsis and Set Photos Arrive as Christopher Nolan Begins Production". /Film. Archived from the original on 25 May 2016. ^ Rottenberg, Josh (21 April 2017). "How Fionn Whitehead went from washing dishes to starring in Christopher Nolan's 'Dunkirk'". Los Angeles Times. Archived from the original on 7 June 2017. ^ "Dunkirk Interview Special". Film4. 21 July 2017. Archived from the original on 1 August 2017. ^ "The strange reason behind why Harry Styles was cast in Dunkirk". The New Zealand Herald. 16 December 2017. Archived from the original on 17 December 2017. ^ Daly, Rhian (9 July 2017). "'Dunkirk' director Christopher Nolan says he 'wasn't aware' how famous Harry Styles was before casting him". NME. Archived from the original on 10 July 2017. ^ Houghton, Jack (15 July 2017). "Cillian Murphy and Kenneth Branagh reveal the horror of World War II epic Dunkirk". The Daily Telegraph. Archived from the original on 15 July 2017. ^ Schaefer, Stephen (16 July 2017). "Mark Rylance musters spirit of epic 'Dunkirk' rescue". Boston Herald. Archived from the original on 16 July 2017. ^ Dunkirk (Motion picture). 1:41:37. ^ Hawkes, Rebecca (23 May 2016). "Christopher Nolan's Dunkirk: first set photos reveal director's vision of wartime France". The Daily Telegraph. Archived from the original on 23 May 2016. ^ Dale, Martin (16 January 2017). "4th Paris Images Trade Show Announces Threefold Increase in Foreign Production Spend in France in 2016". Variety. Archived from the original on 16 January 2017. ^ a b Bal, Jan-Hein; Wolthuis, Johan C.M. (2 September 2016). "65mm Filming for "Dunkirk" on Location in the Netherlands!". in70mm.com. Archived from the original on 26 July 2017. ^ "Urk to host massive Dunkirk film crew as IJsselmeer takes centre stage". DutchNews.nl. 16 June 2016. Archived from the original on 17 June 2016. ^ Macnab, Geoffrey (23 September 2016). "Christopher Nolan's 'Dunkirk' boosts Netherlands rebate scheme". Screen International. Archived from the original on 24 September 2016. ^ "Look who's filming in Swanage this month..." Bournemouth Daily Echo. 1 July 2016. Archived from the original on 29 August 2016. ^ a b Washicko, Cynthia (20 August 2016). "Explosions, gunfire coming to Point Vicente for Christopher Nolan war film 'Dunkirk'". Daily Breeze. Archived from the original on 22 August 2016. ^ Ewart, Alan (1 July 2016). "One Direction: Harry Styles Breaks The Internet But There's No Need To Panic". Inquisitr. Archived from the original on 12 July 2016. ^ Sykes, Hugh (8 August 2017). "What do people in Dunkirk make of the film Dunkirk?". BBC News. Archived from the original on 8 August 2017. ^ a b Sexton, David (13 July 2017). "Dunkirk: everything you need to know about the cinematic event of 2017". London Evening Standard. Archived from the original on 26 July 2017. ^ a b c Evans, Chris (17 July 2017). "Dunkirk: How Christopher Nolan's film found real war ships for epic battle scenes". The Independent. Archived from the original on 17 July 2017. ^ Richford, Rhonda (3 February 2017). "'Fifty Shades Freed,' 'Jackie' Help Boost Foreign Production in France as Incentives Trump Security Concerns". The Hollywood Reporter. Archived from the original on 3 February 2017. ^ Colburn, Randall (13 December 2017). "Christopher Nolan walks you through the most terrifying scene in Dunkirk". The A.V. Club. Archived from the original on 13 December 2017. ^ Hall, Jacob (8 June 2016). "Christopher Nolan Will Reportedly Crash a Vintage WWII Plane For 'Dunkirk'". /Film. Archived from the original on 4 January 2017. ^ Halls, Eleanor (7 June 2016). "Dunkirk: everything you need to know about Harry Styles' new film". GQ. Archived from the original on 18 October 2016. ^ "MLV CASTOR (A810)". Historic Naval Ships Association. 2012. Archived from the original on 18 February 2018. ^ Weijers, Marco (20 June 2016). "Deel 'Dunkirk'-vloot Nederlands". De Telegraaf (in Dutch). Archived from the original on 23 July 2017. ^ "Lowestoft boat stars in Dunkirk Hollywood blockbuster". ITV. 13 July 2017. Archived from the original on 23 July 2017. ^ a b c Mallory Allnutt, Richard (15 August 2016). "Dunkirk – Filming the Aerial Scenes for the Epic Movie". Warbirds News. Archived from the original on 16 August 2016. ^ a b Barry, Aoife (17 July 2017). "Why the epic Dunkirk was the hardest film Christopher Nolan has made". TheJournal.ie. Archived from the original on 17 July 2017. ^ Klimek, Chris (21 July 2017). "Dogfighting Over "Dunkirk"". Air & Space/Smithsonian. Archived from the original on 25 July 2017. ^ Williams, Angela (21 July 2017). "Director Christopher Nolan tells what inspired 'Dunkirk'". ABC News. Archived from the original on 22 July 2017. ^ Fordham, Joe (October 2017). "Deliverance". Cinefex. No. 155. Archived from the original on 16 July 2018. ^ Rooney, Matt (11 January 2017). "Tom Hardy talks Dunkirk, rom-coms & says more Mad Max is "in the books"". JoBlo.com. Archived from the original on 12 January 2017. ^ D'Alessandro, Anthony (2 January 2018). "How DP Hoyte Van Hoytema Captured Christopher Nolan's Miracle Of 'Dunkirk' – Crew Call Podcast". Deadline Hollywood. Archived from the original on 3 January 2018. ^ Davis, Erik (30 March 2017). "Exclusive Interview: Christopher Nolan on Why 'Dunkirk' Is Like Nothing You've Ever Seen Before". Fandango. Archived from the original on 19 May 2017. ^ Sullivan, Kevin P. (21 April 2017). "How Christopher Nolan's Dunkirk is changing the way movies use IMAX cameras". Entertainment Weekly. Archived from the original on 22 April 2017. ^ a b c d Guerrasio, Jason (11 July 2017). "Christopher Nolan explains the biggest challenges in making his latest movie 'Dunkirk' into an 'intimate epic'". Business Insider. Archived from the original on 12 July 2017. ^ Busis, Hillary (7 December 2017). "The Man Behind Dunkirk's Tidy Run Time". Vanity Fair. Archived from the original on 7 December 2017. ^ Grobar, Matt (7 December 2017). "'Dunkirk' Editor Lee Smith On Crafting Larger-Than-Life Experiences For The Eyes & Ears". Deadline Hollywood. Archived from the original on 8 December 2017. ^ a b Gray, Tim (15 December 2017). "How Christopher Nolan's 'Dunkirk' Team Captured the Sounds of Battle". Variety. Archived from the original on 19 January 2018. ^ Giardina, Carolyn (5 July 2017). "Warner Bros. Prepping 'Dunkirk' for One of the Largest 70mm Releases of Last 25 Years". The Hollywood Reporter. Archived from the original on 9 July 2017. ^ a b "WaterTower Music to Release Soundtrack for Christopher Nolan's 'Dunkirk'". Film Music Reporter. 17 June 2017. Archived from the original on 18 June 2017. ^ Hall, Jacob (8 January 2016). "Hans Zimmer Scoring 'Dunkirk': Composer Will Bring the "Braaaahhhm!" to Christopher Nolan's WWII Film". /Film. Archived from the original on 25 May 2016. ^ Licuria, Rob (27 December 2017). "Composer Hans Zimmer: 'Dunkirk' was the hardest thing we ever did' [EXCLUSIVE VIDEO INTERVIEW]". Gold Derby. Archived from the original on 30 December 2017. ^ "'Harry Styles can act!' – First reactions in for Christopher Nolan's war epic Dunkirk". The Daily Telegraph. 11 July 2017. Archived from the original on 12 July 2017. ^ Nordine, Michael (21 July 2017). "'Dunkirk' Soundtrack: Stream Hans Zimmer's Most Intense Christopher Nolan Score Yet — Listen". IndieWire. Archived from the original on 23 July 2017. ^ a b c d Ryzik, Melena (26 July 2017). "Ticking Watch. Boat Engine. Slowness. The Secrets of the 'Dunkirk' Score". The New York Times. Archived from the original on 27 July 2017. ^ Lane, Anthony (31 July 2017). "Christopher Nolan's Wartime Epic". The New Yorker. Archived from the original on 24 July 2017. ^ Burr, Ty (20 July 2017). "'Dunkirk' is a towering achievement, made with craft, sinew, and honesty". The Boston Globe. Archived from the original on 24 July 2017. ^ Philip, Tom (23 January 2018). "Dunkirk Composer Hans Zimmer Knows How the World Is Supposed to Sound". GQ. Archived from the original on 23 January 2018. ^ "Previous Clients / Film". Associated Independent Recording. Archived from the original on 3 August 2017. ^ a b "Dunkirk (Original Motion Picture Soundtrack) on iTunes". Apple Music. 21 July 2017. Archived from the original on 3 August 2017. ^ Tartaglione, Nancy (13 July 2017). "Christopher Nolan Unveils His 'Dunkirk' Experience In London". Deadline Hollywood. Archived from the original on 14 July 2017. ^ "Dunkirk Premiere". Heart of London Business Alliance. Archived from the original on 9 July 2017. ^ Geier, Thom (8 September 2015). "Christopher Nolan's Next Film Lands 2017 Release Date From Warner Bros". TheWrap. Archived from the original on 11 September 2015. ^ Hooton, Christopher (5 August 2016). "Dunkirk trailer: Watch the tense first teaser for Christopher Nolan's new World War II film". The Independent. Archived from the original on 5 August 2016. ^ Mendelson, Scott (6 May 2017). "Trailer: Chris Nolan's 'Dunkirk' Will Try To Be A Rare Breakout World War II Movie". Forbes. Archived from the original on 1 June 2017. ^ a b c D'Alessandro, Anthony (23 July 2017). "'Dunkirk' Takes Warner Bros Past $1B; 'Girls Trip' Record Opening For Malcolm D. Lee; Reasons Why 'Valerian' Crashed". Deadline Hollywood. Archived from the original on 23 July 2017. ^ Sims, David (10 July 2017). "Why Hollywood Should Pay Attention to Dunkirk". The Atlantic. Archived from the original on 11 July 2017. ^ Adams, Sam (5 July 2017). "Christopher Nolan's Dunkirk Will Get the Biggest 70 mm Release in 25 Years". Slate. Archived from the original on 11 July 2017. ^ Bishop, Bryan (5 July 2017). "Christopher Nolan's new film Dunkirk is being projected on 70mm film in 125 theaters". The Verge. Archived from the original on 11 July 2017. ^ Lang, Brent (5 July 2017). "Christopher Nolan's 'Dunkirk' Scores Widest 70MM Release in 25 Years". Variety. Archived from the original on 5 July 2017. ^ Thompson, Anne (29 August 2017). "Christopher Nolan's 'Dunkirk' Enters the Toronto Film Festival Oscar Fray". IndieWire. Archived from the original on 29 August 2017. ^ Sharf, Zack (16 November 2017). "'Dunkirk' Wants to Be the Oscar Frontrunner, Sets Awards Season Re-Release in IMAX and 70mm Theaters". IndieWire. Archived from the original on 17 November 2017. ^ Howard, Kirsten (26 October 2017). "Dunkirk Blu-ray/DVD release date and bonus features". Den of Geek. Archived from the original on 30 October 2017. ^ Perry, Spencer (24 October 2017). "Dunkirk Sets Sail on 4K, Blu-ray, and DVD in December". ComingSoon.net. Archived from the original on 24 October 2017. ^ "First trailer for Christopher Nolan's Dunkirk will be 'shown in cinemas ahead of Suicide Squad'". The Daily Telegraph. 2 August 2016. Archived from the original on 3 August 2016. ^ "Dunkirk Announcement Teaser: A First Look at the Christopher Nolan Film!". ComingSoon.net. 4 August 2016. Archived from the original on 6 August 2016. ^ Calia, Michael (9 August 2016). "Christopher Nolan's 'Dunkirk' Teaser Overwhelms Rival Trailers on Twitter". The Wall Street Journal. Archived from the original on 9 August 2016. ^ Pulver, Andrew (14 December 2016). "Christopher Nolan's Dunkirk: first full trailer released". The Guardian. Archived from the original on 14 December 2016. ^ "Classification Search". Consumer Protection BC. 8 December 2016. Archived from the original on 19 August 2017. ^ Sciretta, Peter (5 December 2016). "Seven Minutes of Christopher Nolan's 'Dunkirk' Will Screen Before 'Rogue One' in 70mm IMAX". /Film. Archived from the original on 15 December 2016. ^ McNary, Dave (19 December 2016). "Christopher Nolan's 'Dunkirk' Soars on Social Media With First Trailer". Variety. Archived from the original on 20 December 2016. ^ Leadbeater, Alex (10 March 2017). "Dunkirk Prologue Playing With Kong: Skull Island IMAX Screenings". Screen Rant. Archived from the original on 19 April 2017. ^ McNary, Dave (29 March 2017). "CinemaCon: Christopher Nolan's 'Dunkirk' Stuns Theater Owners With Epic War Drama". Variety. Archived from the original on 19 May 2017. ^ Hall, Jacob (2 May 2017). "Christopher Nolan Probably Hates This 'Dunkirk' NBA TV Spot". /Film. Archived from the original on 7 May 2017. ^ Sullivan, Kevin P. (5 May 2017). "New trailer for Christopher Nolan's Dunkirk makes it hard to breathe". Entertainment Weekly. Archived from the original on 5 May 2017. ^ Kroll, Justin (5 May 2017). "Watch the New Trailer for Christopher Nolan's 'Dunkirk'". Variety. Archived from the original on 6 May 2017. ^ Warner Bros. Pictures (1 May 2016). "DUNKIRK – 400,000 Men". YouTube. Archived from the original on 24 May 2017. ^ Warner Bros. Pictures (2 May 2016). "DUNKIRK – 933 Ships". YouTube. Archived from the original on 6 May 2017. ^ Warner Bros. Pictures (3 May 2016). "DUNKIRK – 26 MILES". YouTube. Archived from the original on 26 May 2017. ^ Warner Bros. Pictures (4 May 2016). "DUNKIRK – 9 DAYS". YouTube. Archived from the original on 19 August 2017. ^ McNary, Dave (8 May 2017). "Christopher Nolan's 'Dunkirk' Tops Social Media Buzz With New Trailer". Variety. Archived from the original on 9 May 2017. ^ Newton, Andrew (6 June 2017). "Wargaming and Warner Bros. partner". Flickering Myth. Archived from the original on 7 June 2017. ^ McNary, Dave (10 July 2017). "Christopher Nolan's 'Dunkirk' Obliterates Competition on Social Media". Variety. Archived from the original on 11 July 2017. ^ "Dunkirk's seven-minute trailer confuses cinemagoers who thought they were watching Wonder Woman". The Daily Telegraph. 13 July 2017. Archived from the original on 14 July 2017. ^ a b D'Alessandro, Anthony (4 July 2017). "Can 'War For The Planet Of The Apes' Conquer The Summertime Franchise Blues? – Advance B.O. Forecast". Deadline Hollywood. Archived from the original on 5 July 2017. ^ "Barco projector used for Dunkirk sneak screenings". Barco. 18 July 2017. Archived from the original on 27 August 2017. ^ D'Alessandro, Anthony (23 July 2017). "How Warner Bros Beat The Period-Film Curse At The B.O. & Positioned 'Dunkirk' As A Summer Tentpole". Deadline Hollywood. Archived from the original on 25 July 2017. ^ Kelley, Seth (18 October 2017). "Women Powered Summer Box Office Successes, New Data Shows". Variety. Archived from the original on 19 January 2018. ^ "Dunkirk (2017)". The Numbers. Archived from the original on 10 May 2018. ^ Brace, Samuel (12 September 2017). "Dunkirk becomes the highest grossing WWII film of all time". Flickering Myth. Archived from the original on 13 September 2017. ^ Mithaiwala, Mansoor (16 September 2017). "Dunkirk Becomes Highest Grossing WWII Film at Global Box Office". Screen Rant. Archived from the original on 16 September 2017. ^ Kelley, Seth (5 July 2017). "Christopher Nolan's 'Dunkirk' Eyes $40 Million in Early Box Office Tracking". Variety. Archived from the original on 5 July 2017. ^ Staff (14 July 2017). "Long Range Forecast: 'It' Promises September Scares, Will 'Home Again' Counter-Program? ; 'Dunkirk' Buzz Building". BoxOffice. Archived from the original on 16 July 2017. ^ Brueggemann, Tom (7 July 2017). "'Dunkirk' Box Office Tracking Is Low, and Here's Why It's Wrong". IndieWire. Archived from the original on 18 July 2017. ^ D'Alessandro, Anthony (30 July 2017). "'Dunkirk' Marches Ahead Of 'Emoji Movie' For Top Spot With $28M+". Deadline Hollywood. Archived from the original on 30 July 2017. ^ D'Alessandro, Anthony (7 August 2017). "'The Dark Tower' Is Tall Enough For No. 1 With $19.5M During Sluggish Summer Weekend". Deadline Hollywood. Archived from the original on 8 August 2017. ^ D'Alessandro, Anthony (13 August 2017). "'Annabelle: Creation' Comes Alive On Thursday With $4M". Deadline Hollywood. Archived from the original on 14 August 2017. ^ Busch, Anita (22 July 2017). "'Dunkirk' Logs Strong 3-Day Cume Of $21.2M After Key Market Rollout – Int'l Box Office". Deadline Hollywood. Archived from the original on 23 July 2017. ^ Busch, Anita (23 July 2017). "'Dunkirk' Takes Box Office By Storm With $55.4M No. 1 Spot For $105M+ Global Opening; 'Valerian' $23.5M Start – Int'l Box Office". Deadline Hollywood. Archived from the original on 24 July 2017. ^ Tartaglione, Nancy (27 August 2017). "'Valerian' Tops China; 'Wonder Woman' Hits $400M Overseas – International Box Office". Deadline Hollywood. Archived from the original on 27 August 2017. ^ Frater, Patrick (12 July 2017). "'Dunkirk' Gets September China Release After Summer Blackout (EXCLUSIVE)". Variety. Archived from the original on 4 August 2017. ^ Busch, Anita (1 September 2017). "'Dunkirk' Grosses $9.6M First Day For No. 1 Spot' In China, Valerian' Grosses $51.7M First Week". Deadline Hollywood. Archived from the original on 2 September 2017. ^ Kelley, Seth (3 September 2017). "'Dunkirk' Wins International Box Office With $30 Million Debut in China". Variety. Archived from the original on 4 September 2017. ^ Schilling, Mark (11 September 2017). "Japan Box Office: 'Dunkirk' Opening Tops Weekend". Variety. Archived from the original on 12 September 2017. ^ McMillan, Graeme (17 July 2017). "'Dunkirk': What the Critics Are Saying". The Hollywood Reporter. Archived from the original on 20 July 2017. ^ "100 Best War Movies of All Time". Rotten Tomatoes. Archived from the original on 19 August 2017. ^ Nordine, Michael; Thompson, Anne (28 July 2017). "The Best War Movies of the 21st Century, From 'Dunkirk' to 'The Hurt Locker'". IndieWire. Archived from the original on 5 August 2017. ^ "From Dunkirk to Apocalypse Now: the 30 best war movies ever made". The Daily Telegraph. 5 August 2017. Archived from the original on 12 September 2017. ^ "Dunkirk (2017)". Rotten Tomatoes. Archived from the original on 5 December 2017. ^ "Dunkirk reviews". Metacritic. Archived from the original on 6 December 2017. ^ "Dunkirk (2017)". MRQE. Archived from the original on 10 December 2017. .
^ Bradshaw, Peter (17 July 2017). "Dunkirk review – Christopher Nolan's apocalyptic war epic is his best film so far". The Guardian. Archived from the original on 18 July 2017. ^ McCarthy, Todd (17 July 2017). "'Dunkirk': Film Review". The Hollywood Reporter. Archived from the original on 18 July 2017. ^ Dargis, Manohla (20 July 2017). "Review: 'Dunkirk' Is a Tour de Force War Movie, Both Sweeping and Intimate". The New York Times. Archived from the original on 23 July 2017. ^ LeSalle, Mick (18 July 2017). "Not a victory, but a triumph in 'Dunkirk'". San Francisco Chronicle. Archived from the original on 19 July 2017. ^ N.B. (21 July 2017). "Cerebral and tense, "Dunkirk" is a remarkable film". The Economist. Archived from the original on 24 July 2017. ^ Roeper, Richard (18 July 2017). "Christopher Nolan's deeply moving 'Dunkirk' a triumph in filmmaking". Chicago Sun-Times. Archived from the original on 19 July 2017. ^ Nashawaty, Chris (17 July 2017). "Dunkirk is easily the best movie of the year so far: EW review". Entertainment Weekly. Archived from the original on 18 July 2017. ^ Collin, Robbie (17 July 2017). "Dunkirk review: heart-hammering and heroically British, this is Christopher Nolan at the peak of his powers". The Daily Telegraph. Archived from the original on 18 July 2017. ^ Travers, Peter (17 July 2017). "'Dunkirk' Review: Christopher Nolan's WWII Epic May Be the Greatest War Film Ever". Rolling Stone. Archived from the original on 18 July 2017. ^ Medved, Michael. "Dunkirk – Movie Review – The Michael Medved Show". The Michael Medved Show. Archived from the original on 21 September 2017. ^ Zoller Seitz, Matt (17 July 2017). "Dunkirk". RogerEbert.com. Archived from the original on 18 July 2017. ^ a b Mandelbaum, Jacques (19 July 2017). "" Dunkerque " : un déluge de bombes hors sol". Le Monde (in French). Archived from the original on 19 July 2017. ^ Maher, Kevin (18 July 2017). "Cacophony of war sinks star-studded blockbuster". The Times (72278). p. 23. ISSN 0140-0460. ^ Cox, David (26 July 2017). "Bloodless, boring and empty: Christopher Nolan's Dunkirk left me cold". The Guardian. Archived from the original on 28 July 2017. ^ Wood, Michael (17 August 2017). "At the Movies". 39 (16). London Review of Books: 43. Archived from the original on 2 March 2018. ^ Calhoun, Dave; Huddleston, Tom; Jenkins, David; Adams, Derek; Andrew, Geoff; Davies, Adam Lee; Fairclough, Paul; Hammond, Wally; Kheraj, Alim; de Semlyen, Phil (10 September 2018). "The 100 best British films". Time Out. Archived from the original on 3 April 2019. ^ Hornaday, Ann (17 August 2018). "The New Canon". The Washington Post. ^ Hammond, Peter (6 December 2017). "Critics' Choice Awards Nominations: 'The Shape Of Water' Leads With 14; Netflix Tops TV Contenders". Deadline Hollywood. Archived from the original on 6 December 2017. ^ Tapley, Kristopher (11 January 2018). "'Shape of Water,' 'Big Little Lies,' 'Handmaid's Tale' Top Critics' Choice Awards". Variety. Archived from the original on 19 January 2018. ^ "Bafta Film Awards 2018: All the nominees". BBC. 9 January 2018. Archived from the original on 10 January 2018. ^ "BAFTA winners 2018: All the awards including best film, leading actor and actress". The Daily Telegraph. 18 February 2018. Archived from the original on 18 February 2018. ^ Staff (7 January 2018). "Golden Globes: Complete Winners List". The Hollywood Reporter. Archived from the original on 8 January 2018. ^ Tapley, Kristopher (23 January 2018). "Christopher Nolan Scores His First-Ever Oscar Nomination for Best Director". Variety. Archived from the original on 23 January 2018. ^ Respers France, Lisa (5 March 2018). "Oscar winners 2018: The list". CNN. Archived from the original on 5 March 2018. ^ a b c d Broich, John (20 July 2017). "What's Fact and What's Fiction in Dunkirk". Slate. Archived from the original on 24 July 2017. ^ Sebag-Montefiore, Hugh (29 July 2017). "Hugh Sebag-Montefiore: Dunkirk – inaccurate film has touches that reflect the truth". The Yorkshire Post. Archived from the original on 29 July 2017. ^ Mosbergen, Dominique (24 July 2017). "Dunkirk Veteran Weeps At Film Premiere: 'It Was Just Like I Was There Again'". Huffington Post. Archived from the original on 26 August 2017. ^ a b Alexander, Bryan (20 July 2017). "'Dunkirk': How historically accurate is Christopher Nolan's WWII battle film?". USA Today. Archived from the original on 25 July 2017. ^ Savignac, Baptiste (18 July 2017). "Dunkerque, cinq anecdotes du tournage racontées par Christopher Nolan". Le Figaro (in French). Archived from the original on 25 July 2017. Levine, Joshua (27 June 2017). Dunkirk: The History Behind the Major Motion Picture. HarperCollins. ISBN 978-0062740304. Mottram, James (18 July 2017). The Making of Dunkirk. Insight Editions. ISBN 978-1683831075. Nolan, Christopher (8 August 2017). Dunkirk. Faber & Faber. ISBN 978-0571336258.